The launch of a coordinated action plan on youth by UN agencies marks a potentially transformative approach to the way in which the United Nations works with and for young people across the world. This attempt to establish horizontal coordination across UN entities should not be underestimated, but will not be without challenge. In our first analysis, we examine some of the challenges lying ahead. Under the leadership of UN-DESA, UN-HABITAT and UNFPA, the Inter-Agency Network on Youth Development (IANYD) has sought to address both internal and external criticisms through the development of a System-wide Action Plan on Youth (Youth-SWAP). The Youth-SWAP – which forms a part of the Secretary-General’s Five-year Action Agenda related to youth – aims to establish a coordinated and coherent approach to youth development across the United Nations agencies. It focuses on five thematic areas: employment and entrepreneurship, political inclusion, civic engagement and protection of rights, education including comprehensive sexuality education, and health. Although in its early stages, the development of the Youth-SWAP is demonstrative of a renewed and reinvigorated effort by the UN to give ascendancy to youth issues; the energy and commitment required to establish a clear strategic vision and commitment to the agenda across dozens of disparate UN agencies, programmes and offices should not be underestimated. By seeking to visibly mainstream youth in the UN, the Youth-SWAP has the potential to raise the profile of youth issues in a number of important policy areas, whilst also improving the accountability of the UN system. 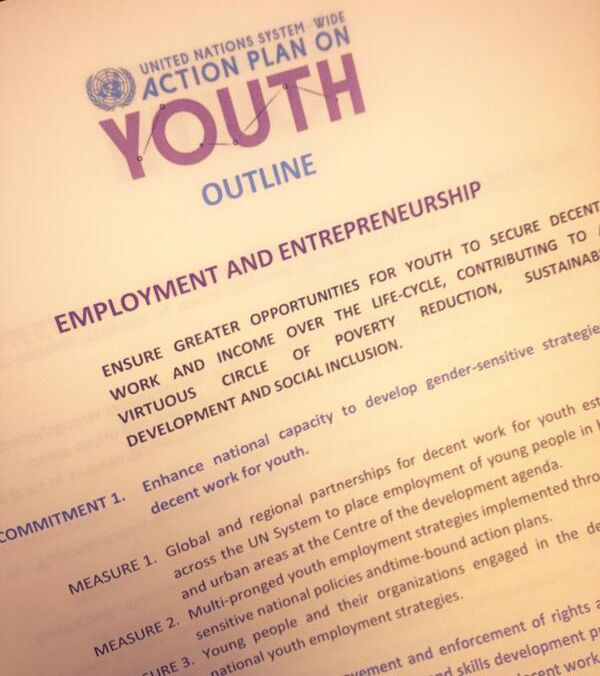 The UN has consulted and created opportunities for youth to contribute to the development of the Youth-SWAP. 13,500 people participated in a SWAP survey designed to seek input from youth and other stakeholders, and over 150 youth sector professionals had the opportunity to contribute to discussions at the Inter-Agency Network on Youth Development’s Open Meeting (18-20th September 2013). The attempt to establish horizontal coordination across UN entities, spearheaded by the Youth-SWAP, will not be without challenge. So, whilst welcoming and acknowledging the work done to date, let’s examine five of the bigger challenges that still have to be overcome. Is the Youth-SWAP more than repackaging existing activities? 1. // In implementing the Youth-SWAP, the UN system will ‘identify ways in which existing activities can complement each other in order to exploit synergies’; there is explicitly no new money – despite repeated arguments, including by the UN Youth Envoy, that the youth sector is chronically underfunded within and beyond the UN. The Youth-SWAP therefore risks to exclusively tweak and repackage existing activity, encroaching on the potential to create much-needed conditions for cross-agency collaboration. While it is encouraging that the Youth-SWAP will explore the process of developing joint programming, this must become a reality and will require the redistribution of existing resources as well as strategic and substantial fundraising for new resources. 2. // Although the inter-agency coordination required to develop the Youth-SWAP has already demonstrated its potential to establish a clearer strategic vision on paper, it has yet—beyond the meetings associated with its production—to deliver concrete action. The Youth-SWAP must ensure that the efforts to describe and communicate a more coordinated approach do not distract resources away from achieving the aims of the agenda. 3. // The Youth-SWAP Action Plan details a range of commitments and measures with lead/supporting entities and indicators. In its current form and format, the plan fails to set out a credible causal link between the overall goals and the proposed actions. Rather than focus on outcomes, it lists activities—that may or may not affect the desired outcome—and proposes measures that effectively involve ‘counting activity’ rather than monitoring progress towards the desired outcomes. Surely, measuring progress in fighting youth unemployment, for example, should focus on the number of new and decent jobs that are being created rather than whether new reports, frameworks or strategies have been developed. How will the Youth-SWAP lead to better accountability? 4. // It remains unclear to what extent the indicators under consideration can be properly measured and against which criteria the indicators will be assessed. Where will the data come from? How robust will the data be? Who will collect the data, who will provide it, how will bias be prevented? The Youth-SWAP’s impact framework remains to be designed, and answers to these questions have yet to be developed; answers that will effect not only the feasibility and impact of the System-wide Action Plan on Youth but in extension also mark the quality of accountability mechanisms within the UN system and towards the stakeholders of the global youth sector. 5. // To-date, no concrete decisions have been made about which 15 countries will be prioritised for the pilot launch of the Youth-SWAP, resulting in a sense that the agenda has been designed back-to-front. How can a credible action plan be developed without a comprehensive understanding of context? This issue becomes even more important when, as a member organisation, with limited budget, the action plan’s aims relate to issues over which the UN system has very little direct control. For example, UN agencies have limited influence over the ‘number of financial institutions scaling up financial services for young people’ (3.2.1), yet it is currently one of the SWAP indicators under consideration. One exciting development, as was inferred during the Open Meeting of the Inter-Agency Network on Youth Development, is to review commissioning and partnership arrangements to enable youth-led or youth-sensitive organisations to design and deliver services. This has the potential to allow the UN to support innovative and disruptive approaches to service delivery that become exemplars of effective practice, though the exact details of this proposal are not finalised. Despite many challenges on the road to implementation, the Youth-SWAP represents a significant and welcome shift in focus, coordination and alignment of UN programmes. Its success will only become fully assessable in some years, but a first immediate sign of success or failure will be its transition from an agreed strategic document to a real change in the working relationships of UN agencies. Will agencies begin to cooperate more strategically, seeking to cover the priority areas of the System-wide Action Plan on Youth? Will the resulting cooperation agreements be bureaucratic monsters, or will they allow dynamic, locally-led and context-specific interventions to emerge? Will these interventions focus relentlessly on improving the lives of young people, and will such improvements be sustained and systemic? We do hope so, and will continue to cover the developments around the System-wide Action Plan on Youth on youthpolicy.org regularly. Written and researched by John Muir with Alex Farrow, edited by Andreas Karsten.